Sonic is now going to be shooting and scoring in more ways than one. SEGA Amusements USA in Elk Grove Villiage, Illinois will be showcasing the brand new Sonic-themed arcade games at the International Association of Amusement Parks and Attractions show in Las Vegas later this month. 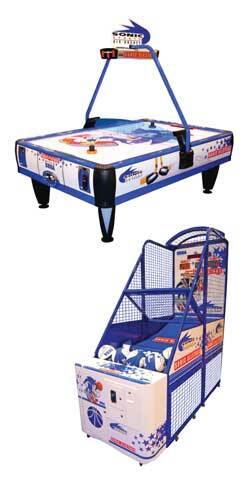 The first two games in the “Sonic All-Star Sports” line will be air hockey and basketball. “Many people have been wanting Sega to come up with much more traditional redemption sports games such as basketball and air hockey,” said Sega Amusements USA president and COO Paul Williams. Air hockey features chasing LEDs for when players score and a scratch-free surface. Basketball features varying levels of difficulty and can be linked up with other cabinets for 16-person multiplayer. Look out for more sports arcade attractions in this new series in the future. Visit SEGA Amusements USA’s official home page.